Making what I need with my hands. 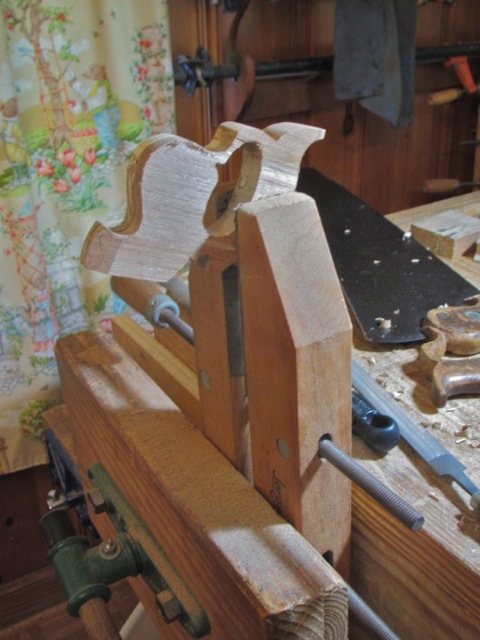 This week, I began building two saws, each with a different story behind it. First, the stories. A few months ago, my next-door neighbor was cleaning out her shed and threw out a lot of junk. My oldest daughter, K, was rummaging through the junk pile looking for whatever a 7-year-old might consider a “treasure,” and she pulled out an old saw plate. It was a skew-back, about 22″ long, with at least two different sets of holes drilled for the handle. The teeth were well worn and a little uneven. Clearly this saw had seen a lot of use, and not a little repair. But the plate was dead-straight, so I put it aside, promising K that I would make a kid-sized handle for it someday. My old broomstick-handled Crown dovetail saw has seen better days. But recently, I acquired a dovetail saw kit from Isaac Smith at Blackburn Toolworks. The kit consists of a toothed saw plate, a spine, and two saw nuts. The kit has been sitting on my workbench for a couple of weeks now, and I’ve been itching to get it assembled. When I got the kit, I also ordered some saw nuts for K’s saw. If you want to make your own saw, I highly recommend that you read Isaac’s series of blog posts on how he makes a saw from start to finish. Selecting the wood for the handles was pretty easy. I have a lot of spalted pecan on hand, and it makes beautiful tool handles. 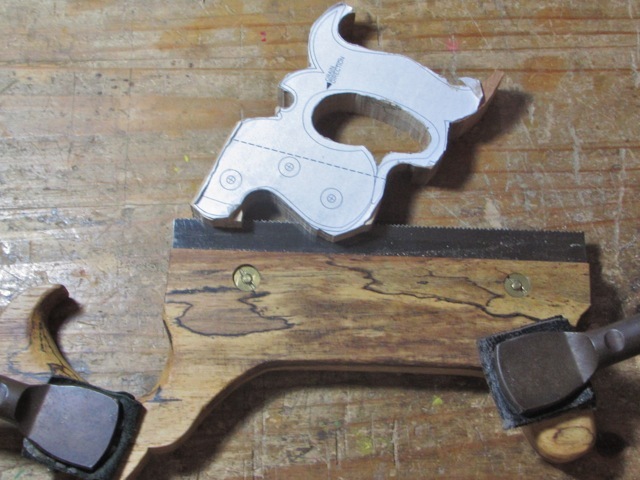 This wood is tough and difficult to split, so I can make a relatively delicate saw handle without worrying much about whether the handle will break if I drop it. 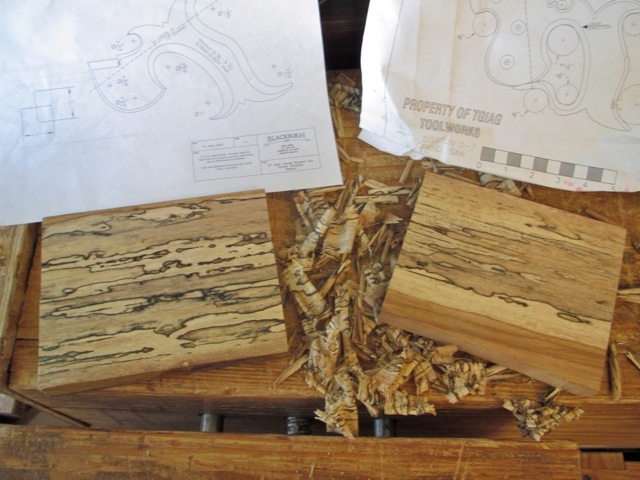 I chose stock that was rough-sawn to about 1″ thick and planed it down to about 7/8″ thick. I also downloaded a template for each handle. 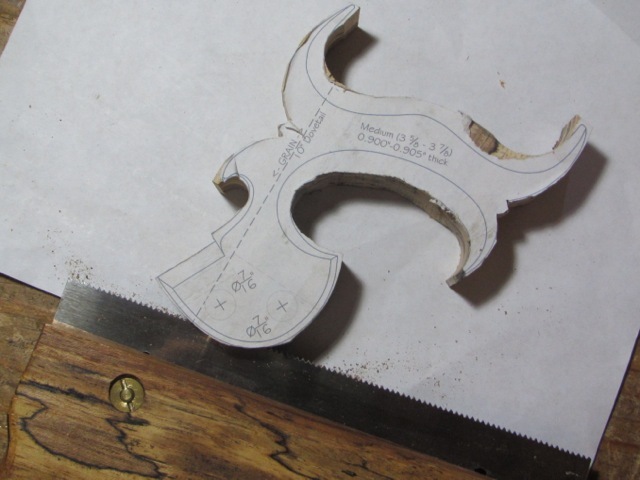 For my own dovetail saw, I used the medium-sized dovetail saw template from Blackburn Toolworks. For K’s panel saw, I used the Disston D-7 pattern from Dominic at TGIAG, but I printed it out at 80% of full size so as to fit a child’s hand. 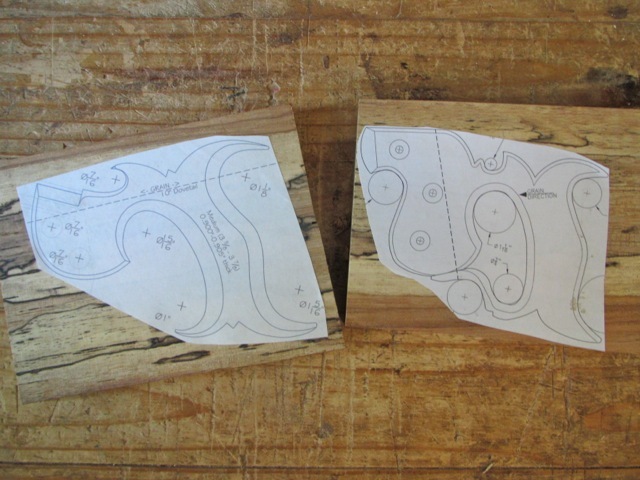 After cutting out each template, I used a glue-stick to adhere each pattern to the wood. I tried to orient each one to get the best figure out of each piece of wood. Then I took the wood down to the drill press and drilled out several holes with Forstner bits. That makes for very smooth, even curves. I didn’t have all the recommended sizes, and the sizes listed on the smaller template were now wrong because I had scaled it down. So I just picked the bit that seemed the closest to each radius, and that worked fine. While I used the bandsaw to waste away a lot of the remaining wood, my turning saw came in handy for the inside of K’s handle. I also used it to cut out a number of details in both handles. 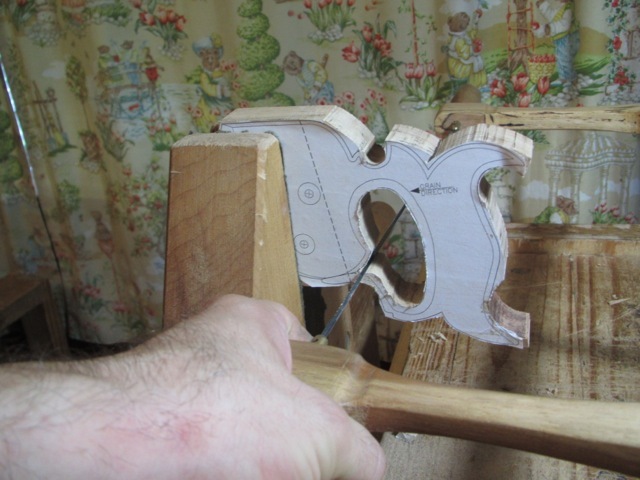 When properly tensioned, the bow saw is extremely accurate. The most delicate operation is sawing the slot for the blade. If the slot is sawn crooked, the saw won’t work properly. First I marked out the slot with a marking guage. There are a number of ways to cut the slot itself, but I figured out a pretty simple method. I laid my stair saw on the benchtop and held it down with holdfasts. Then I moved the workpiece back and forth to mark out the slot. This handle is exactly the same thickness of the stair saw, which is on purpose. The other handle was a little thinner, so I raised it up on a sheet of paper so that the saw blade hits the exact middle. If I were making a handle from thicker stock, I would put paper under the stair saw instead. I didn’t cut the whole slot with the stair saw; I only went about 1/4″ deep all around. Then I put the saw handle in a vise and finished the cut with a regular hand saw. Shaping the saw handle required a number of half-round rasps and files. Although I’m working to pencil lines, it is largely a matter of freehand sculpting. I’m not dead-set on copying every detail of a pre-existing saw, so the sculpting remains somewhat spontaneous. Clamping a large handscrew upright in a bench vise is a good way to hold the work. At the end of the day, I have K’s saw handle all shaped and ready for scraping and sanding–as well as drilling the holes for the nuts. Next up: shaping my dovetail saw handle, and doing a little metal work. This entry was posted in Build-Alongs, Tool Making and tagged Blackburn Toolworks, dovetail saw, pecan wood, saw building, saw handle, saw making, saw plate, spalted pecan, stair saw, TGIAG. Bookmark the permalink. Nice work. I really like my cheapo Stanley sharp tooth panel saw and I have considered making a nicer handle. The blades could be disposable. I’ll keep thinking. 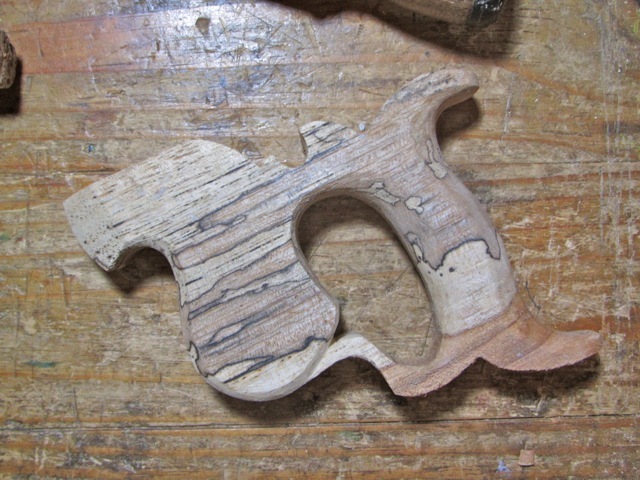 Those are going to be some purdy handles. I love that spalted pecan. That must be quite a pile of pecan you have Steve, It’s showing up everywhere. Great looking handles! Thanks for mentioning and linking to Isaac Smith. In my earlier searches for saw parts and kits, I missed him, What a great find! Thanks. Issac makes BEAUTIFUL saws. TGIAG (linked above) also sells parts for backsaws. Both are a great value, in my opinion.